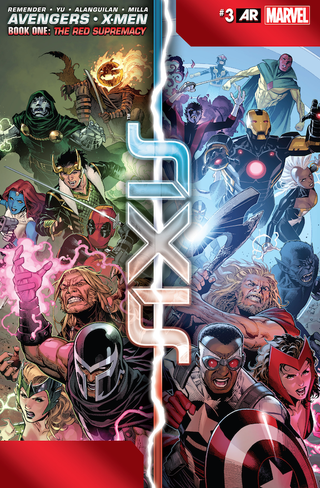 Writer Rick Remender should teach a masterclass in juggling: not only has he been planting seeds for this plot since Uncanny Avengers #1, but now he's working with dozens of characters, each with their own voices, their own agendas. For the most part... he pulls it off beautifully. So Deadpool (Hi Deadpool! Hi!) drags Iron Man away from the wild rumpus while dyed-in-the-wool bad guys tackle the Red Onslaught and his adamantium-plated sentinels. (The panels use a lotta red. Big surprise.) Below, Doctor Doom and Loki trade arrogant bon mots before entering the fray themselves. Magneto finally puts his powers to their best use and rips one sentinel apart. I swear I can almost hear that vibrating-metal hum from the movies. The artwork is gorgeous, and we have Leinil Francis Yu to thank for that. The colors, courtesy of Matt Milla, Laura Martin, and Edgar Delgado, bring it all to life. I'm only a little sorry to say that the villains are better coordinated than the heroes were. They operate separately, sure, but they hit their targets dead-on. Phase Two involves the distracting apparition of the original Captain America. Red Onslaught can't take his eyes of him… at least until Cap morphs back into Mystique. Gotcha. Enchantress lives up to her name, putting the Big Bad entirely in her thrall. It is equal parts awesome (her) and pathetic (him). E is looking forward to conquering the world with her enslaved Skull-Puppet… ew… until the 2nd sentinel breaks her concentration. Damn. The whole thing plays out like a messed up spandex-wrapped chess game. The Red Onslaught takes over the bad guys and has them try to rip into the good guys looking over Scarlet Witch and Doctor Strange. Sabretooth is a hair's width from gutting Kid Apocalypse when lo and behold, a timely intervention from Deadpool! Welp, the Sentinels are garbage, the villain recruits have all vanished, and the awake-again heroes find the Red Skull: Alive, and fully intact. Because of reasons. I'm sure there have been other bad guys who died, got super sized, and got their bodies back after they were trounced. I just can't think of any. Regardless. The Avengers and the X-Men immediately disagree on what's to be done with him. Word on high— literally— comes down from Steve Rogers, who ends the debate and says that RuSkie will be held in Avengers Tower 'til he can be tried for crimes against humanity. AXIS isn't done, not by a far sight. The Avengers and the X-Men are back to distrusting each other. Whatever's next, I'm in for the long haul. Casey Jones is an author and voice-over artist. He is taking part in NaNoWriMo, because he is a masochist.